Despite aching from the previous day "exercise" of Tug of War with discarded drift net (http://wildfilms.blogspot.com/2007/12/taking-out-trash-belayar-creek-labrador.html), I simply could not let the opportunity of visiting Chek Jawa comes to pass. Together with like minded friends, a day in the realm of Nature is definitely worth the Orchard crush. 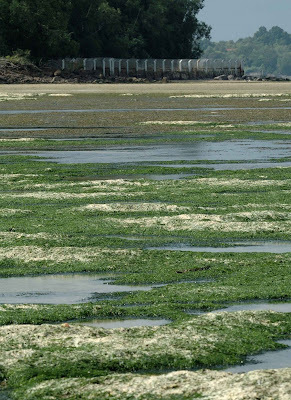 I have been to Chek Jawa, the shore side but have never ventured into the inter-tidal area. This will be my first time and indeed the shore is so abundant with organism that thankfully this area was spared from development into Housing Blocks! Starting at the boardwalk, there are already much to see. This plant (Flemingia strobilifera) has two unique type of leaves. The puffy flower like leaves, are actually folded leaves and in the olden days, these leaves can be used as filling for pillow! 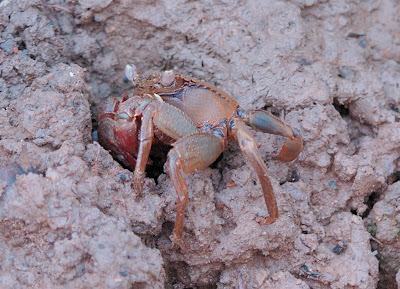 There were many types of crabs along the board walk, many were busied scurrying into their nest which in this case belongs to the Mud Lobster. 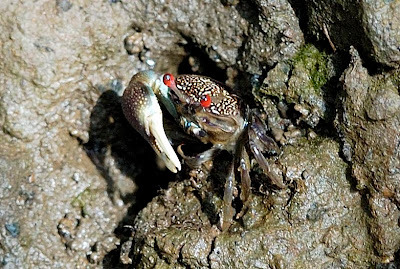 Below is a Mangrove Crab (Family Grapsidae). This type of crab is also known as Vinegar crab in that the Chinese especially the TeoChew pickle them with black vinegar, and it is then taken with porridge. This is the female juvenile Uca dussumieri. Approaching the inter-tidal area, we were greeted by this huge expanse of Green Carpet, but then there were many areas covered by Yellow/White blotches. 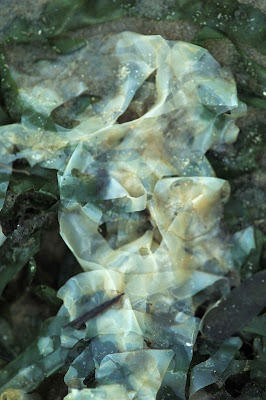 Only when one goes down on the knees and examine them, did one realised that it is the Green Sea Weed that has been bleached. See the following photo. 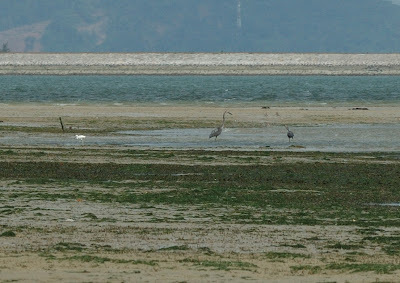 Facing seaward, the feather friends were having a feast on the sand and mud banks. 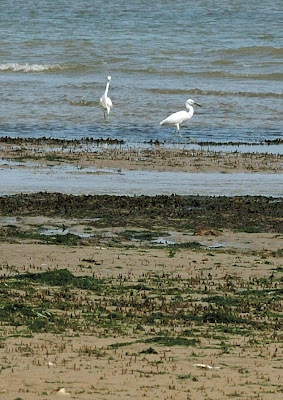 The Little Egrets were less shy, and I was able to reduce my distance from them. Whereas the Great Billed Herons were quite shy. Pictures taken from a distance. As was in Pulau Sekudu, there were many Hermit Crabs that dwell here. (Sekudu is just next door to Chek Jawa). 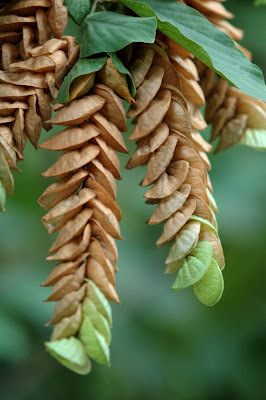 The biodiversity should be quite similar. 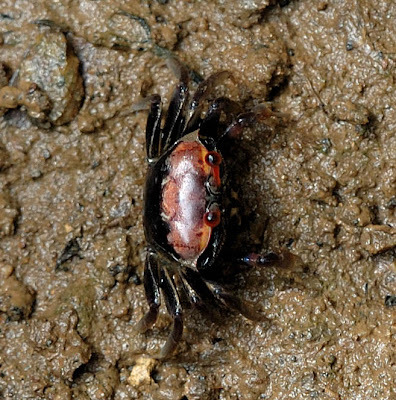 Most common hermit crabs that we have seen are the Striped Hermit Crab (Clibanarius sp). 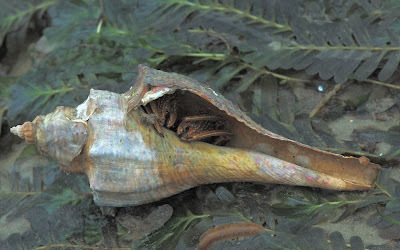 In the picture below, the hermit crab is using the shell of a Volute, and in the other picture, it is the shell of a Conch. 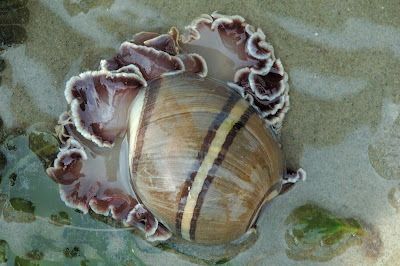 Other than the exposed parts, the rest of the hermit crab is very soft, and will be vulnerable to be eaten or attacked if it does not have some kind of protection. The shell is one example, but heavy camouflaging is also vital for their survival. This hermit crab is big, and the volute shell that it has occupied was huge. 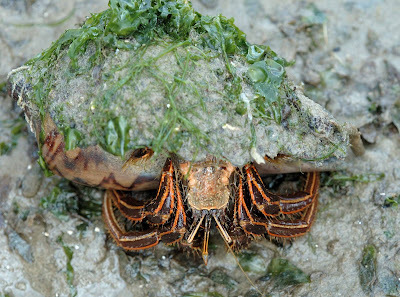 Still this hermit crab has taken camouflaging to a very high level. If it has not moved, one will have easily given it a miss! We were glad that we managed to see two different types of Horseshoe Crabs. The smaller Mangrove horseshoe (Carcinoscorpius rotundicauda) and the bigger Coastal horseshoe (Tachypleus gigas). 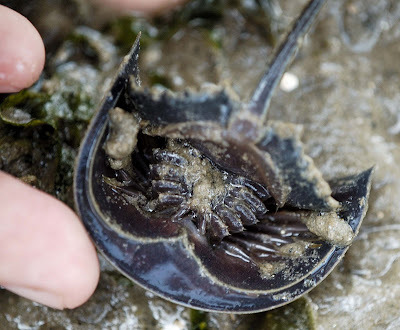 The Horseshoe Crab is not truly a crab but belongs to the Spider family. I have always been fascinated by their eyes. It has more than ONE pair of eyes. 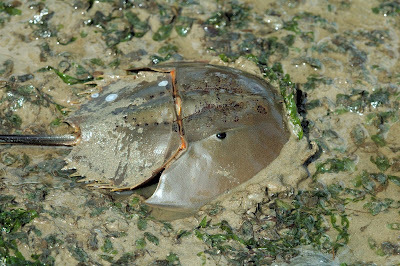 The Horseshoe crab has a total of 10 eyes. Eyes are found on the underside as well as on the tails! But the most prominent of all the eyes, must be the one on either sides. 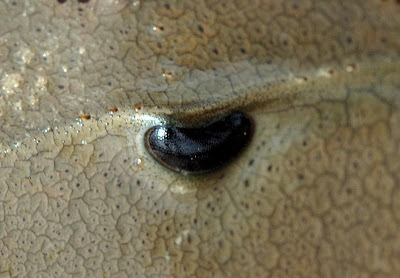 The Lateral Compound eyes. These are used for finding mates. Of course - what can be more important than to pro-create. Talking of pro-create, June found this mass of "mee sua", which we believed are the egg capsules of certain slugs. 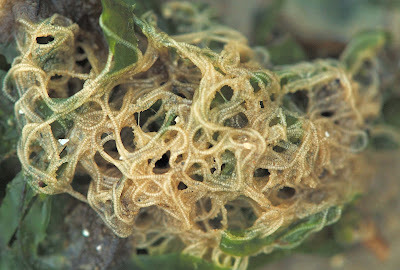 Look closely, and you will see the round eggs inside the strand. Like mother hen, June ensured that we did not trampled on her precious brood! Good for June. 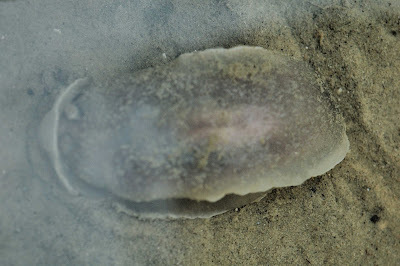 First time I came across this Nudibranch Armina babai, unlike most nudi, this one was not colourful and rather plain. The uniqueness of this nudi is that its gills are on the side. See the picture immediately below this. 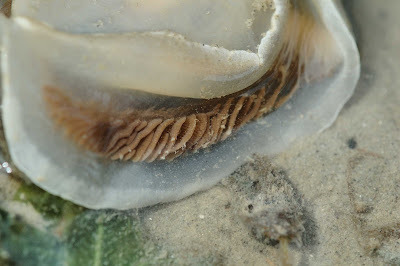 The gills of the Armina babai. The greatest find of the day must be this Headshield Slug. Previously this has been identified as belonging to the Hydatinae family, but has been provened to be wrong. The correct family should be Aplustridae. The specimen that we saw is most probably a Hydatina zonata. This is a very beautiful slug, it feeds on polychaete worms. Its mantle is so huge that it cannot be totally retracted within the shell. For defence, it relies on camouflage and its ability to swim. Probably due to the previous fresh water carnage, most of the sea cucumbers that we saw were juvenile, wish them "Grow up quickly". The specimen below was found by Samson, and it was smaller than his watch. 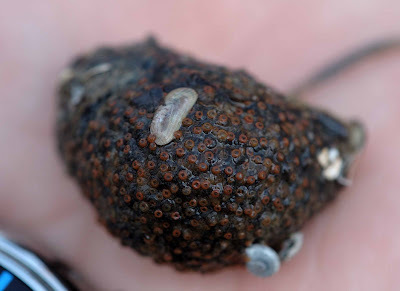 This Ball Sea Cucumber (Phyllophorus spiculata) was small, the Button Shell is even smaller. The sea cucumber belongs to the Echinoderm class. 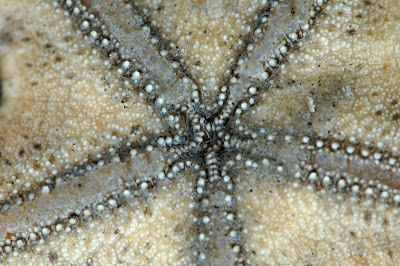 Similar to this will be the Sea Stars and the Brittle Stars, which we saw a fair number of them as well. 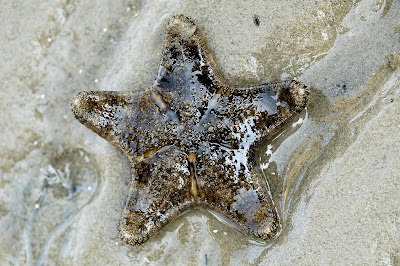 We came across this candidate which most of us suspect could be Cake Sea Star. 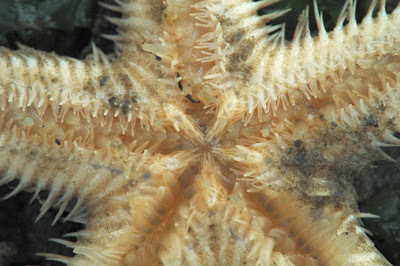 But from the "A Guide to Sea Stars and Other Echinoderms of Singapore", this specimen seems to be the Gymnanthenea laevis (Family Oreasteridae). According to this book, the notable features are the spine-like tubercles on the central radial plates, and the arms are slightly upturned at the ends. Another look at the Gymnanthenea laevis but from the underside. 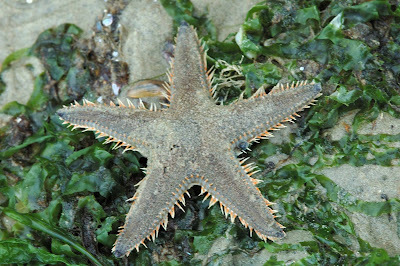 Unlike the sea-star above, the specimen below is the Spiny Sandstar (Astropecten indicus). It has pointed legs and with that many legs, is also a very good burrower and it is in this domain that it hunts for its preys. Lastly, why is the triangular object moving against the current? 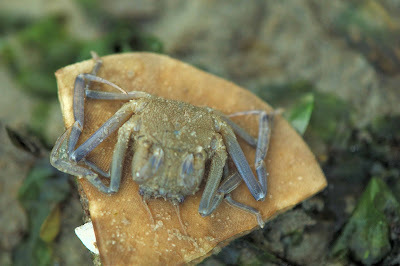 Answer, there is a Leaf Porter Crab (Neodorippe callida) below. This is how this Leaf Porter Crab caught our attention. It possesses special claws to hold on to the leaf or in this case a covering. Usually a nocturnal creature, we were very fortunate to come across this one, and quite a big handsome one too. They tend to grow to about 15 mm, and the one we saw was about this size. Indeed Chek Jawa is full of surpises, and I wish that it will remain so for the future generation to come in appreciation and awe.